A cross between a finch and a canary is called a mule, which in essence is a hybrid breed of bird. 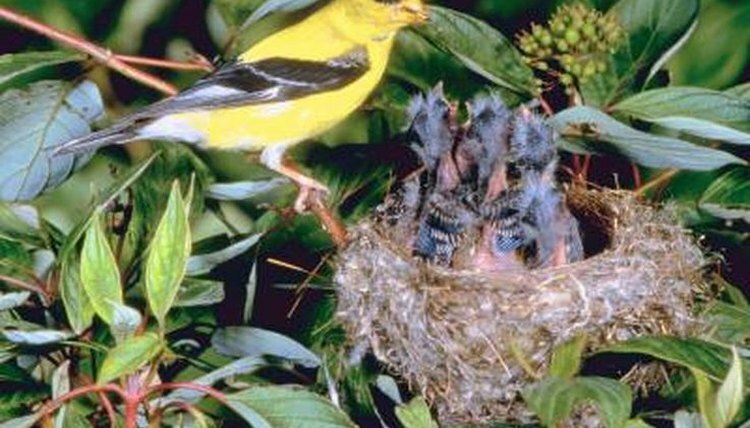 Crossing a canary with a finch produces a bird with a more melodic tone and the longer, happier life of the domestic canary. The green finch and gold finch are the most popular variety of finches to successfully breed with the canary. During breeding season, usually around February, the birds may breed up to three times. Be sure to have a good high-protein diet for the birds. When the eggs begin hatching, place some nestling food in the cage near the nest. The hatchlings will begin eating on their own almost immediately and grow rapidly. Once they have left the nest completely, train the hatchlings, via tapes, to be able to sing various wild finch notes and special strong trills, which is most often the reasoning for crossing these two bird species. After breeding season, keep the birds separate until next year's breeding season.